Today's post is another installment of my coverage of our big joint birthday party. Of course, I had to make a ton of crafts. For Arthur's first birthday, I had made a photo board so I had to do one for Q. Instead of a board, I went with cute banner for the fireplace. Very cute! Next up, I made the goody bags. 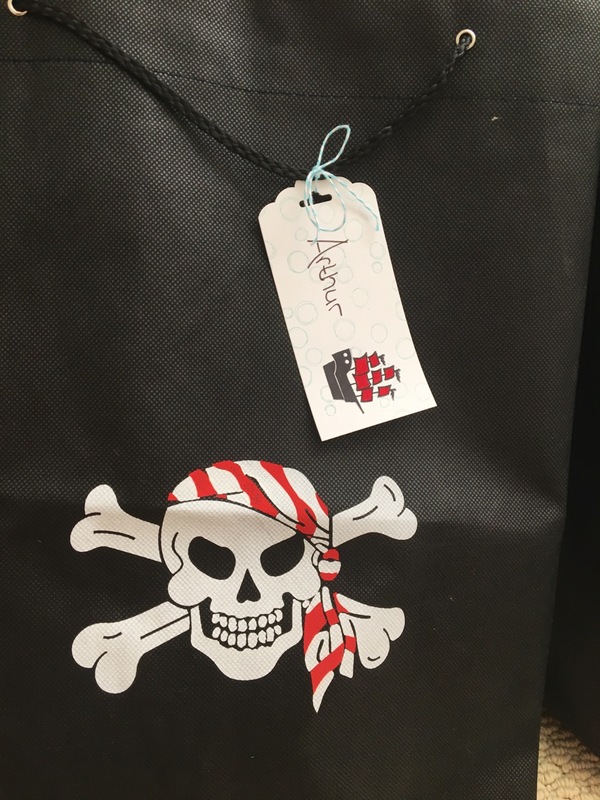 Each bag had a foam sword, eye patch, pirate hat, bag of Pirate's Booty, pirate tattoos, a compass, and a ring pop. The baby bags had a pirate rubber duck, graham cracker goldfish, and a beach ball. I made these cute little name tags featuring images from Message in a Bottle Stamp Set. I covered the dining room table with some kraft paper, stamped on some anchors, and put of two pirate ships in the middle. I later added some chocolate gold coins, bags of goldfish and pirate's booty, and ring pops to the table. Time to decorate the kitchen aka main party area. 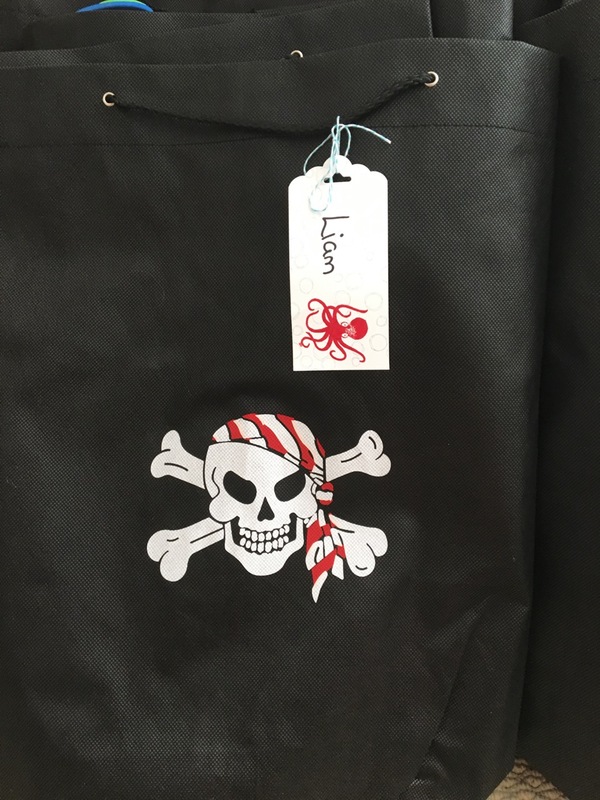 I bought this huge pirate flag to hang on our back door. (The flag will find a permament place somewhere in our house). 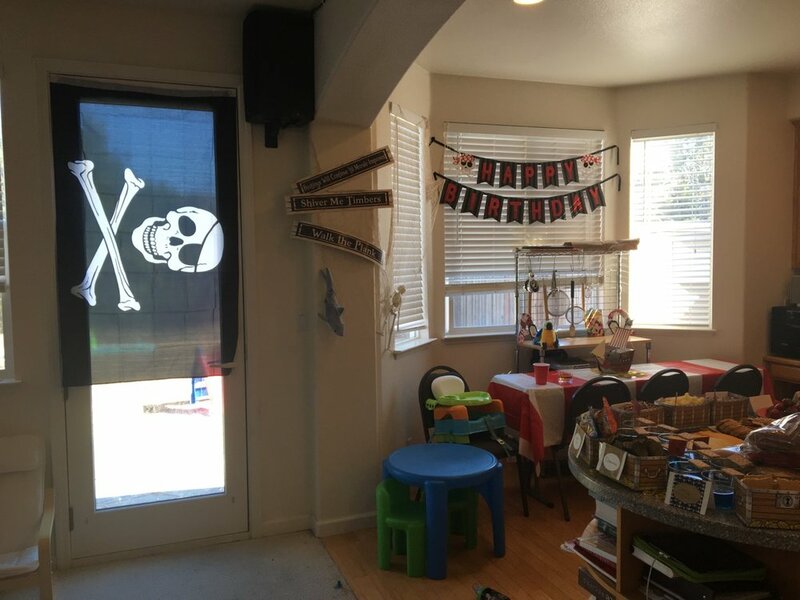 I grabbed these awesome pirate signs, fish net, skeleton, and great white shark for decor. 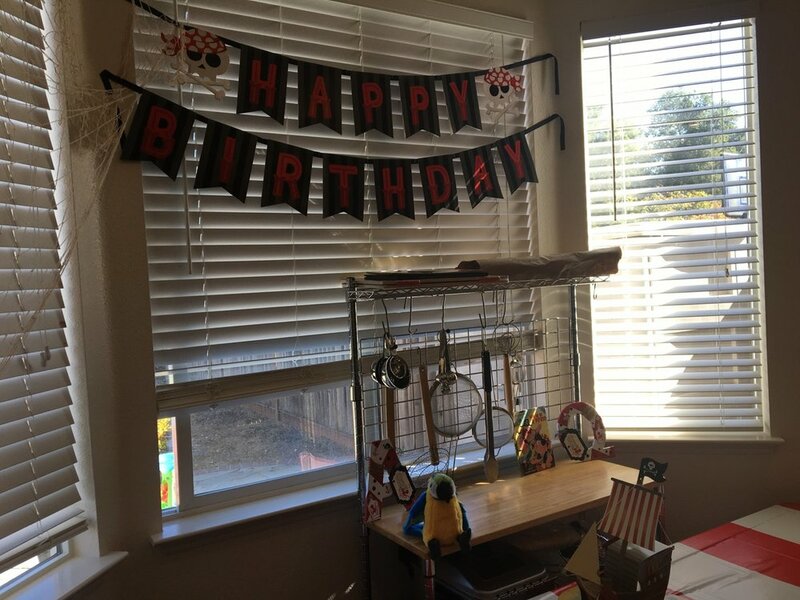 I also couldn't pass up this fun Happy Birthday banner. This table was used for eating during the party. I added the other pirate ship for decoration. The baker's rack served as our present holder during the party. I featured my cute crafted letters, a pirate book I bought Q, and a fun stuffed parrot. Pirates have to have a parrot! I conquered my fear of piping to frost some vanilla cupcakes. I added some gold rocks and homemade pirate flags. These cupcakes were so yummy! You can just make out some skull plates in the background. Very cute! The cake came from Costco, because nothing can beat $18.99 for half sheet of actually good cake. I did buy and add these cute pirate decorations.